Two Polish novelist arrive in Merseyside this Wednesday both leading writers in Poland. I’m writing this because the English book market is the world’s largest and most translated, but the elite group of writers across the globe who can feel confident that their books will be translated into English could all fit around a medium-sized conference table. Two of those seats would be reserved for Magdelena Tulli and Asia Monika Bakalar who will be, along with other distinguished authors, at Southport Town Hall for one evening of literary discussion. Looking back, Polish literature for centuries focused more on drama and poetic self-expression than on fiction which is dominant in the English speaking world. The reasons for this were manyfold, but mostly, rested on historical circumstances of the nation. Polish writers typically have had a more profound range of choices to motivate them to write such as a huge violence that swept the country over fifty years ago. ‘Pole Position’ the literary organisation in this country organising this event has been formed as a result of numerous initiatives and vibrant collaborations amongst many individuals and institutions devoted to promoting the best literature on the UK market. And, yes, some of the recommended authors are Polish. Asia Monika Bakalar (top right) was born and raised in Poland. As a child she spent her holidays with her family in a small village in the eastern part of Poland where she milked cows and axed chickens heads. She earned her MA degree in English Literature at the University of Wroclaw then embarked on as a doctorate student for three years at Birkbeck College before moving and living in London. It was here that she researched her book ‘Madame Mephisto’. 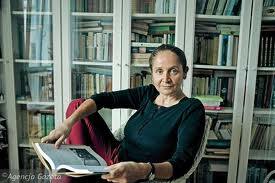 It was among UK readers recommendations to the Guardian’s First Book Award and it gained her the title of being the first Polish woman to publish a novel in English since Poland joined the EU in 2004. Having read her book, I found she takes the reader on a roller-coaster, fast paced, ranting tour with her charismatic anti-heroine over Polish patriarchial obsessions and London’s drug-dealing scene, corporate culture and migrant solitude, very realistc. In the book ‘Red’ by Magdalena Tulli, translated by Bill Johnston, she tells a fantastical, dark and parabolic fairy tale of Europe’s 20th century crisis and transformations as seen through the eyes of …..wait for it……..bizarre inhabitants of a fictional and somewhat sinister town called Stitchings. She certainly has, as one of my teachers would say …..”a vivid imagination”. If you are looking for a good read this Christmas then Kindle one of these books and you will certainly not be disappointed. The night will include a buffet from the local restaurant Gdanska. What a fantastic evening with Magdalena Tulli. I’ve just ordered her book!